Provide comfort for the family of Shirley Wilkinson with a meaningful gesture of sympathy. Shirley Ann Wilkinson, 74, of Palatka, passed from this life on Thursday, April 4, 2019 at Solaris Health Care Center following an extended illness. Born in Statesboro, Georgia, she was a lifelong resident of Palatka. Shirley retired after working many years as the Supervisor of the Civil Division at the Putnam County Clerk of Courts office. She was a member of the First Baptist Church in Interlachen. In her leisure, Shirley loved dancing and spending time with her family. She was preceded in death by her husband, “Don El” Wilkinson, her parents, Leo Stafford and Ruby Hendley Stafford and a brother, Leroy Stafford. Shirley is survived by her children, Cam Coleman (Marilyn) of Orange Park, Scott Coleman (Angela) of East Dublin, GA, Bushell Wilkinson (Sheri) of San Mateo, Denise Flanders (George) of San Mateo, Danny Wilkinson of East Palatka and Darlene Buchanan (Danny) of St. Augustine, a sister, Donna Gillman (Todd) of Hollister, 9 grandchildren, Madison Coleman, Jessica Lyman (Jon), Joshua Coleman, Sammy Flanders (Jennifer), Will Flanders (Tiffany), Chelsea Mullins (Chris), DeeDee Mullins, Tiffany Mullins and Ashley Conditt (Zac), 6 great-grandchildren, 4 nieces, Tiffany Gillman, Bobbi Gillman, Kaedi Gillman and Vanessa Gillman and a great-niece, Ruby Gillman. Services celebrating Shirley’s life will be at 11:00 A.M. Monday, April 8, 2019 at Johnson-Overturf Chapel in Palatka with Pastor Shaun Thomas officiating. Burial will follow at San Mateo Cemetery. Visitation will be Sunday from 6-8 P.M. at Johnson-Overturf Funeral Home in Palatka. Memories and condolences may be expressed to the family at Shirley’s Book of Memories page at www.johnsonoverturffunerals.com. To send flowers in memory of Shirley Ann Wilkinson, please visit our Heartfelt Sympathies Store. 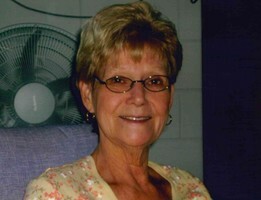 Provide comfort for the family of Shirley Ann Wilkinson by sending flowers. My sincerest condolences to Bushell and entire Wilkinson family, so sorry for your loss. Cherish the memories you shared with her. May our merciful God give you comfort and strength during this time.